“Ice Cream” is a poem from Souwesto Home, James Reaney’s recent collection of new poems, published by Brick Books in 2005. 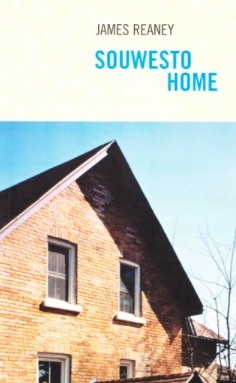 Souwesto Home by James Reaney, 2005, Brick Books. Cost only a nickel each! And the ceiling was of pressed tin! So, I plunk down a nickel for a Maple Walnut! The Post Office is French Provincial with 4 clocks. The poet holds his bicycle up with his left hand. Walks slowly licking as he proceeds. It was two years ago today that James Reaney passed away. His nephew, Scott Thibaudeau, read “Ice Cream” at a celebration of James Reaney’s life held in early July at Aeolian Hall in London, Ontario. There was Maple Walnut ice cream for everyone at intermission. 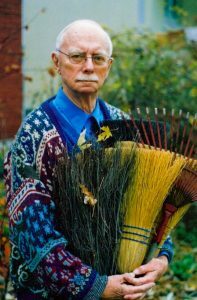 James Reaney at home in London, Ontario, 2005. Photo by Jeff Culbert.